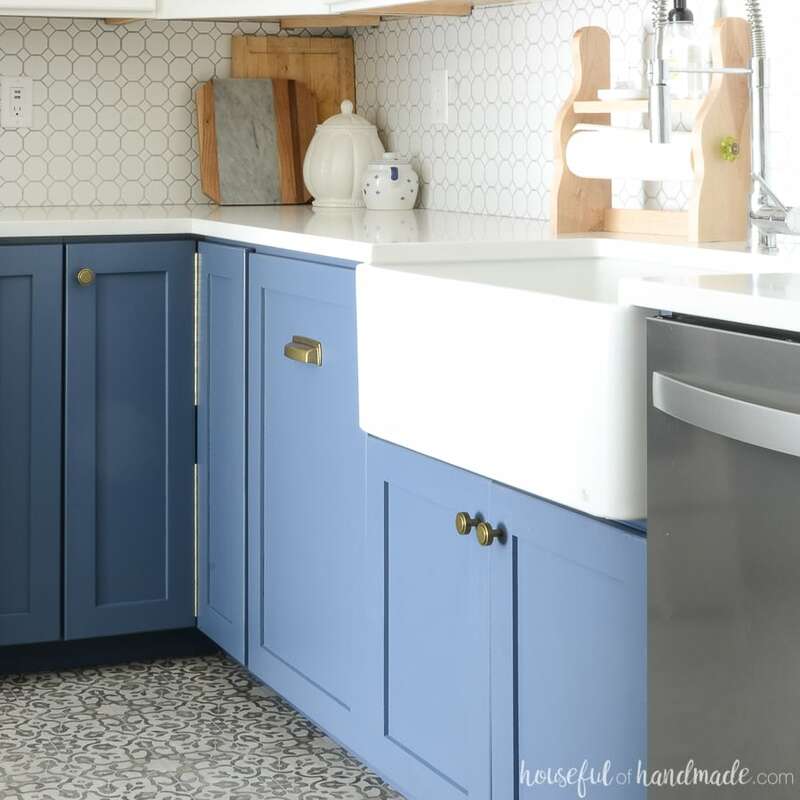 If you want a large apron front sink in your next kitchen, you’ll want to read these things to know before buying a farmhouse sink. 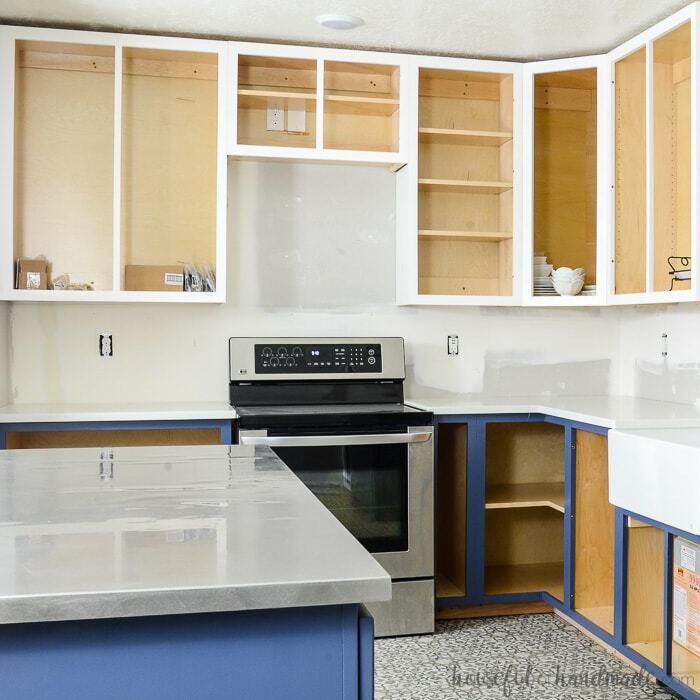 It’s been 4 months since we finished our Blue & White two toned kitchen remodel. 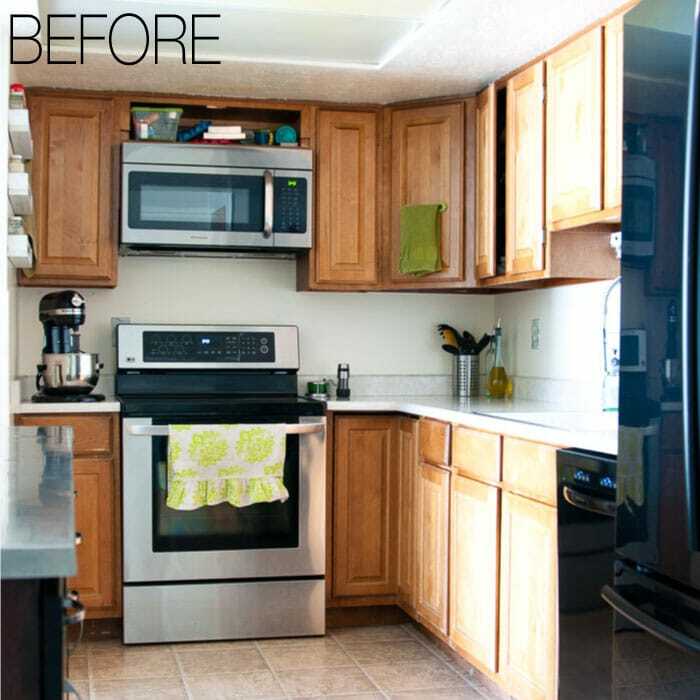 Even though it was a big job, I have never regretted the craziness that is a kitchen remodel. One of the big elements we added to our kitchen was a large farmhouse sink. I had been coveting big beautiful, single-basin, apron front sinks for a while and knew I wanted it in our kitchen. 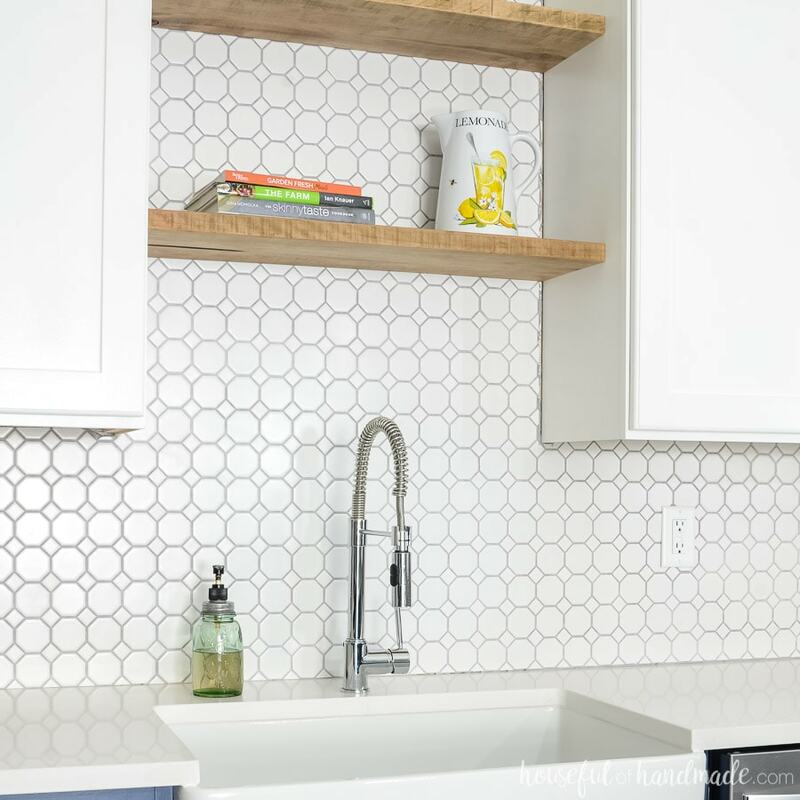 As much as I love our farmhouse sink, there were some surprises we learned during our kitchen remodel. Large apron front sinks are different than a regular sink. Here are some things I wish I had known before buying a farmhouse sink. My dream was a large, single basin, white apron front sink. These types of sinks typically cost around $1000 and as much as $2000. That is how much we spent on all the wood needed to build the cabinets for our entire kitchen! 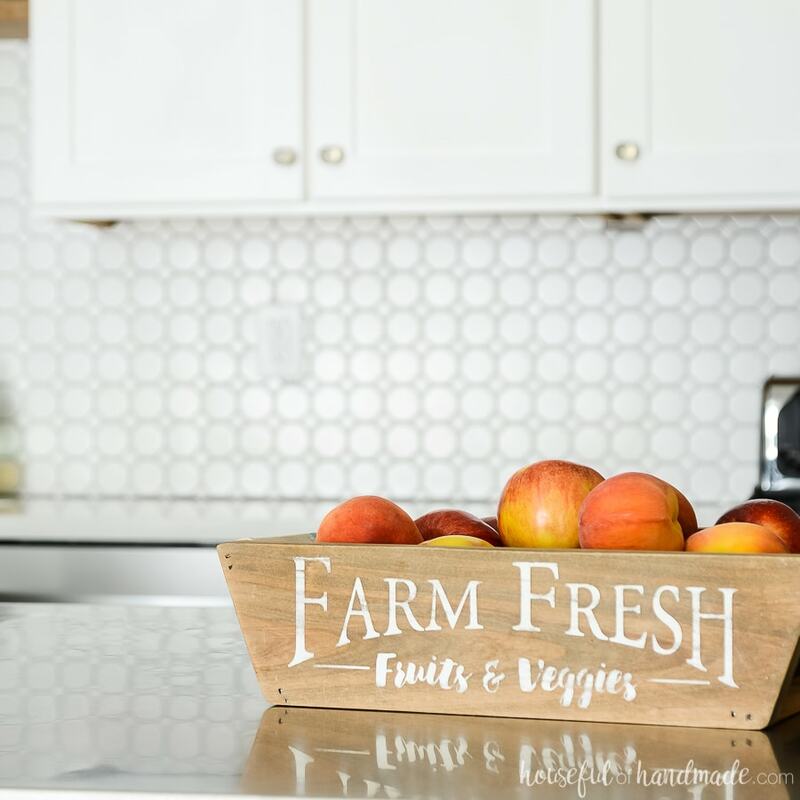 I did lots of research and found this wonderful, more budget-friendly, farmhouse sink and I love it. But it still cost over $500 for just the sink. If a traditional farmhouse sink is not in your budget, don’t fret. There are other options. You can find stainless steel apron front sinks for much less. And Ikea has an apron front white sink option, but it is not as deep as a traditional farmhouse sink, plus it has a sink divider (or they have a new smaller version without a sink divider). When you are working on a kitchen remodel or kitchen refresh, I am sure you have a budget. 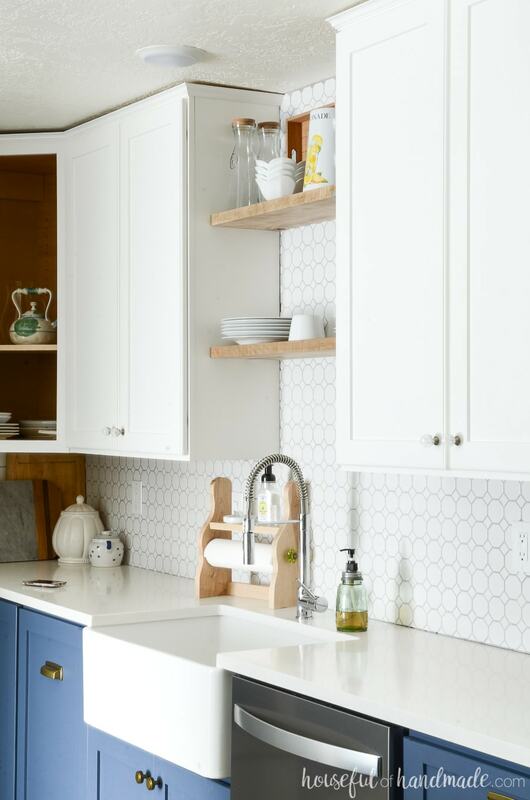 If you plan to add a farmhouse sink to your space, it is good to know about the hidden costs so you can properly budget for them. We were surprised a few times by the added costs. If you plan on adding a garbage disposal to your farmhouse sink, you will probably have to buy an extended flange to attach it to the sink. Most farmhouse sinks are extra thick so the normal flange does not fit. You would think a flange would not be an expensive item, but as I was trying to find the right one, I learned it was. The extended flange can cost almost as much as the garbage disposal so be prepared. Because the apron front sink is much deeper than a standard sink, you may have to adjust plumbing in order for things to drain properly. Our previous sink had one higher drain and one lower so we were able to use the lower sink drain, but if not, we would have had to bring in a plumber which costs $$. I know it seems odd that I am including this in the list of things to know. Of course, farmhouse sinks are large, that part of their appeal. But I didn’t realize just how big it was until it was installed. It takes FOREVER to fill the sink with water. And then just as long to drain. If I am trying to just wash a few items (dishes, fruits, etc.) I prefer to place a large bowl in the sink instead of filling up the sink. Because the sink is so large, you loose a lot of under-sink storage space. And if you put a garbage disposal in, you loose even more space (also make sure to measure your under sink room to make sure your new garbage disposal will fit, it’s that tight). We have had to get creative with our under-sink storage to make everything fit. And some of the items had to be moved to the linen closet instead. I have heard that a lot of contractors do not like farmhouse sinks because of installation. We installed our own sink and I found it quite doable. To make the install smoother, the sink base cabinet was built to the sink specifications (I built our kitchen cabinets also). So no modifications on the cabinets were needed. Then we installed 2×4 braces directly into the cabinets after they were installed. Extra time and care needs to be taken to ensure everything is level. These sinks are super heavy and get even heavier when in use (remember how much water I mentioned they can hold). If installation is done poorly, fireclay sinks can crack. We did LOTS of research before attempting our DIY farmhouse sink install and took the extra time to double check everything along the way. Because of this we had no problems and I would install a farmhouse sink again! All these things to know before buying a large apron front sink are not intended to scare you off. Every day I use it, I love it even more. We have enjoyed the large basin for so many things and the big bold sink is something that everyone loves when they come to visit. So I thought I would finish with the top reason of why you will love your farmhouse sink too. The large, deep sink bowl makes it easy to fill and clean large pots & pans. You can easily bathe babies or small animals in the kitchen sink (no more bending over the tub). The front of the sink is right at your belly so no leaning over the counter, like with a standard sink, means less back strain. You can hide lots of dirty dishes in the sink when company is coming. The beautiful white apron is statement piece for your kitchen. So if you have been considering a big, beautiful farmhouse sink for your kitchen, I hope this has helped understand the challenges that come with it. Being an informed buyer and DIYer is way better than getting yourself into a situation you are not prepared for. The easiest way to save a lot of money on a kitchen remodel is to do it yourself! We completed a DIY Kitchen Remodel for a 6 week challenge. 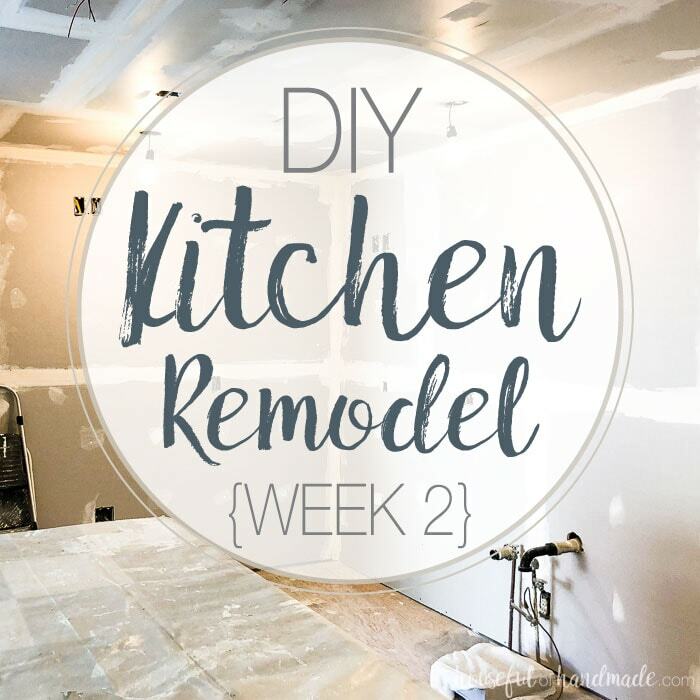 Our kitchen remodel included taking the room down to the studs, building our own kitchen cabinets and cabinet doors, remodeling the kitchen island, and more! 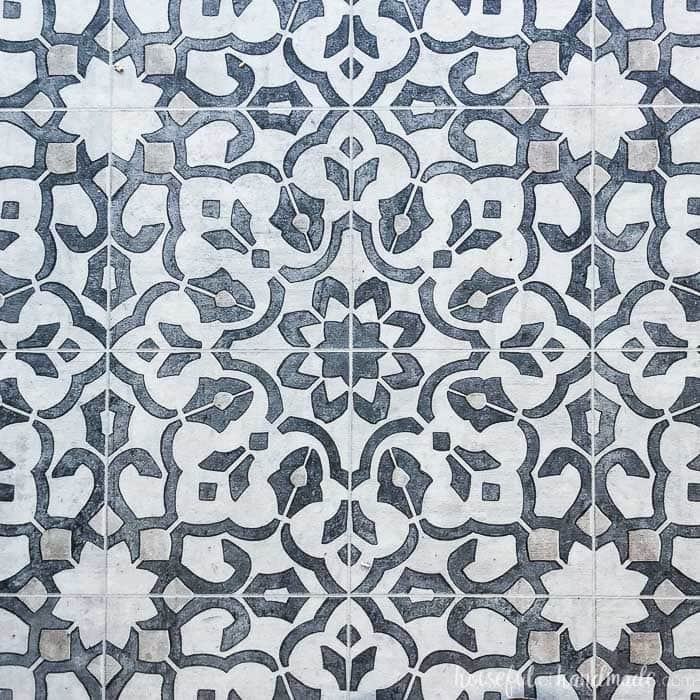 Make sure you don't forget anything when planning your DIY kitchen remodel! 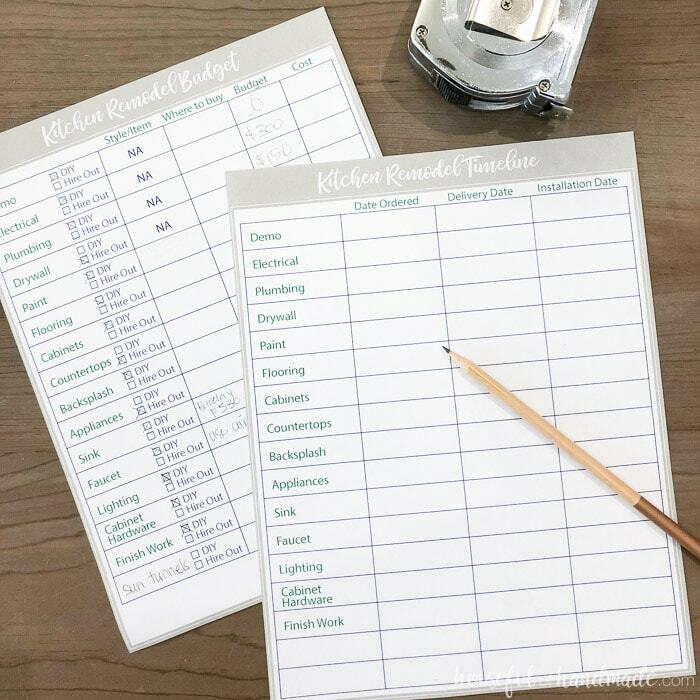 These printable kitchen planning sheets help you track timeline, schedules, and product information to help your kitchen remodel succeed. 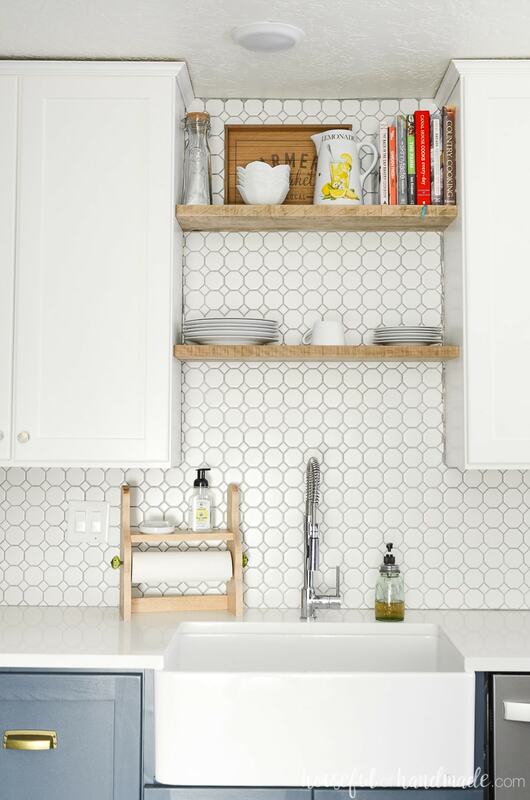 Remodeling your kitchen doesn't have to be expensive. See our budget kitchen design for ideas and tips for your own DIY kitchen remodel. Things are starting to happen on our DIY kitchen remodel. See the progress and any set-backs we encountered. One more week of work on the DIY kitchen remodel means more progress. Now the question is "Can we really remodel our kitchen in just 6 weeks?" When the kitchen is the most important room in the house, surviving without one is hard! Here are the things we have learned about surviving a kitchen remodel and tips for making it easier. Buying unfinished kitchen cabinets or building your own cabinets is a great way to save tons of money on a kitchen remodel. 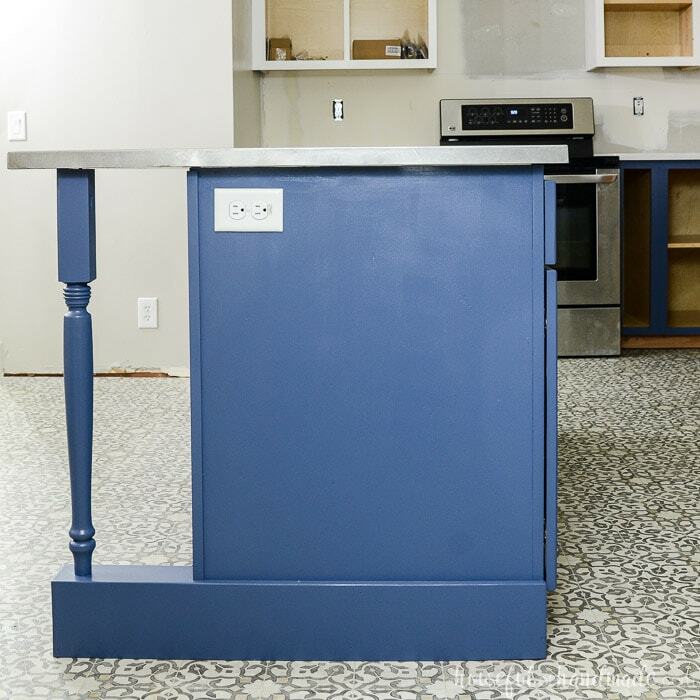 Learn how to paint those unfinished kitchen cabinets. We didn't replace our kitchen island. Instead we gave it a makeover. Now it is a beautiful farmhouse kitchen island and cost very little to do. 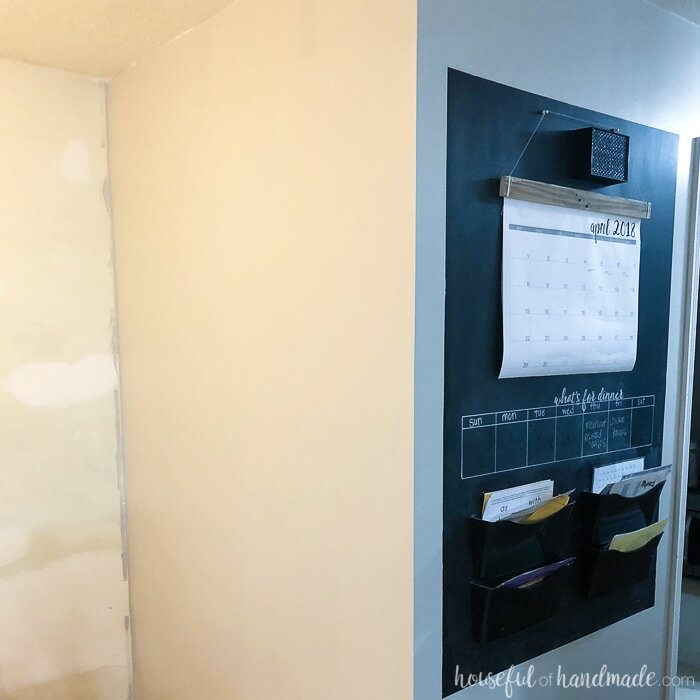 Budget Farmhouse Kitchen Remodel Reveal... Almost! The 6 week is up! We have a "mostly" finished kitchen. Come see the reveal of what we did in this short time. Now the DIY kitchen remodel is complete! 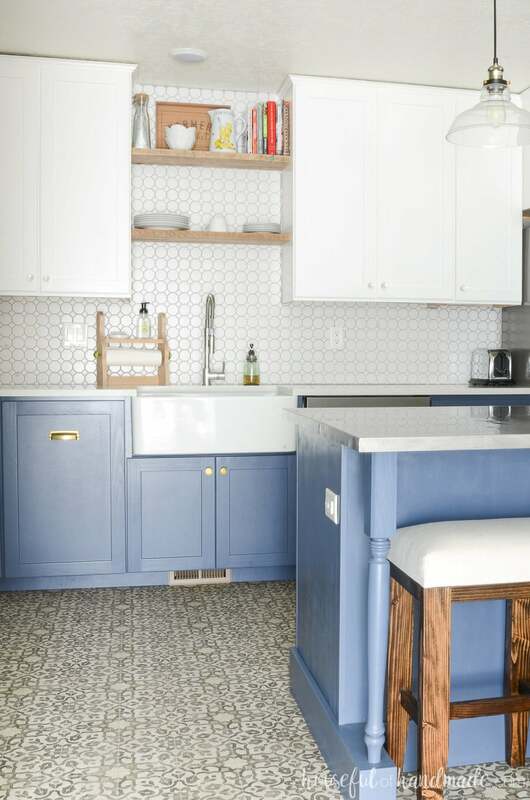 This budget friendly kitchen looks like a million bucks and is beautiful and functional. You do not want to miss it! Your kitchen turned out beautiful and hope to someday put in a double farmhouse sink someday when i remodel my kitchen. Thank you for your tips and ideas. Hello, where can I find your wooden paper towel holder/shelf? Thanks! That is a DIY. You can find the tutorial here: Farmhouse Paper Towel Holder. I love the look of your remodel—great job! I am planning to install a farmhouse sink in our laundry room and am trying to learn about the install and cabinet design. Can you please share the resources you looked at? How many 2×4 s are needed for bracing? Thanks! Thanks Max! I cannot even remember what I read, I read so so many things and talked to so many people. For our sink, we have 1 2×4 on each side of the cabinet.